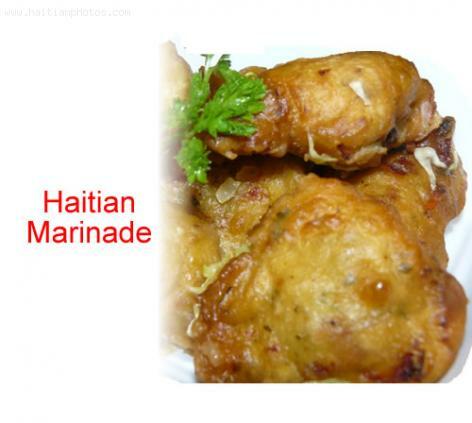 How to makr Haitian Marinades. Stir water into flour to make batter. Mix in chilies, parsley, and baking powder. then, add chicken and salt. Spoon dollops of batter into hot oil, turning them until brown. To prepare Vegetarian Marinade using a blender. Blend water, shallot, onion, garlic, scallion, parsley, and Adobo. In mixing bowl add rest of ingredients plus blended ingredients to make batter.